Time for some back-to-school shopping! Looking to up your style game for the new school year? One easy way to look more polished is to invest in basic, versatile pieces with unique details. 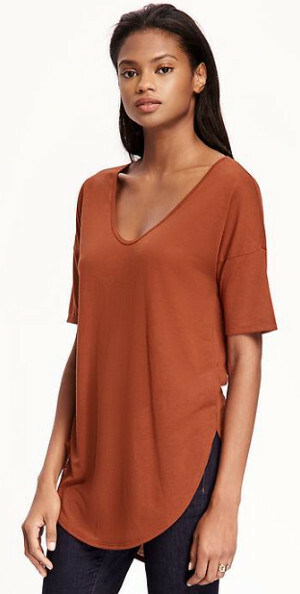 For example, this week’s Fabulous Find is a comfy, basic tee from Old Navy that stands out because of its longer length and flattering tulip hem. It also comes in several colors that are perfect for fall, like this burnt orange shade. For a trendy look, try some fun, throwback pieces. Tuck the top into a button-front denim skirt, and slip on some classic white sneakers. To give the look a bit of polish, grab a sleek burgundy satchel. Try this look if you’re craving fall weather, but it’s still too warm outside for sweaters. Pair the tee with classic straight leg jeans (and don’t forget to cuff them at the bottom). Next, pull on your favorite new booties, and for a touch of autumnal color, paint your nails a mossy green. Stacked gold rings make the perfect finishing touch. This is how you look polished on a hectic morning. Keep your style easy and comfortable by pairing this tee with a lightweight midi skirt. Add polish with classic touches, like pointed-toe leopard flats and tortoiseshell sunglasses. How are you stepping up your style this year? Do you like basic pieces with a twist? Let us know in the comments!